Take your senses on a tropical trip without even leaving the comfort of your home. Formulated with shea butter, avocado oil and other fine ingredients, this creamy body butter helps moisturize and smooth the look of your skin, leaving it scented with the refreshing blend of exotic coconut and guava. Make your escape to an oasis of luxury. Ingredients: Aqua/Water/Eau, Cetearyl Alcohol, Prunus Amygdalus Dulcis (Sweet Almond) Oil, Glycerin, Coco-Caprylate/Caprate, Dicaprylyl Carbonate, Helianthus Annuus (Sunflower) Seed Oil, Dicaprylyl Ether, Squalane, Butyrospermum Parkii (Shea) Butter, Persea Gratissima (Avocado) Oil, Cetearyl Glucoside, Alcohol, Ascorbic Acid, Ascorbyl Palmitate, Benzyl Alcohol, Benzyl Salicylate, Butylphenyl Methylpropional, Ceteareth-33, Citric Acid, Coumarin, Hydroxyisohexyl 3-Cyclohexene Carboxaldehyde, Imidazolidinyl Urea, Lactic Acid, Limonene, Linalool, Parfum/Fragrance, PEG-8, PEG-40 Hydrogenated Castor Oil, Phenoxyethanol, Potassium Sorbate, Pyrus Cydonia Fruit Extract, Tocopherol, Vitis Vinifera (Grape) Seed Extract, Xanthan Gum. 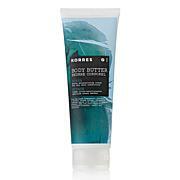 I have bought this numerous times and really enjoy the smell and the results of my skin by using this. Love it! Smells so good! Wonderful moisturizer! Love! I frickin love this fragrance and formulation, it's, the best; make more in sets for goodness sakes. I've been wanting to try this product for a long time and finally gave in. I'm so glad I did ! This lotion is very moisturizing and smells clean. 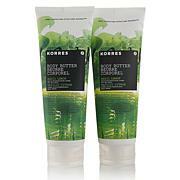 Thanks HSN for bringing Korres to customers who can't get it where they live.